[Siva, Maheswara, Rudra, Vishnu, Pithamaha or Grand father, Physician of the Universe, Sarvajna or the All- Knowing, Paramatma are the major eight names in vogue] Of the above Eight Names, there is an angle of ‘Upadhis’ or basis among the first Five Names from Siva to Pitamaha; the Five Upadhis are ‘Sthulopadhi’ (The Gross Body), ‘Karmopadhi’ (The Causal Body), ‘Sukshmopathi’ (The Subtle Body), ‘Akasa’ (The Divine Thought or Consciousness) and ‘Atma’ (The Inner Soul). There may thus be a number of names, but basically, there is only one name which has no Upadhis ie. 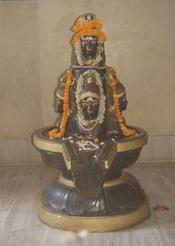 Nirupadhi; no Gunas ie. Nirguna and no Vikaras ie. Nirvikara: He is Siva only! The next name is of Maheswara Tatva Gyan of twenty three Tatvas thas accompanied by the Maya Tatva or Prakrithi posseessing the twenty fourth Tatva and in all the twenty fifth Tatva of Purusha is Maheswara. The next name of Bhagavan is Rudra who is the root cause of Sorrows and is also the effective remover of Sorrows too.But Vishnu being the all- pervasive Shakti spreads and perpetuates ‘Maya’ by the interaction of ‘Tatvas’and hence Vishnu is the cause and effect of Tatvas of Siva. Pitamaha is another primary name of Siva who is responsible for Srishti and is the Eldest of the World or the Great Guiding Force of Humanity. Vaidya or the Physician of not only the physical ailments all the residents of the Universe but more importantly is the most efficient curer of the Other-wordly feelings, actions and aspirations by endowing with right guidance of Tatvas and Siva Gyan to lead onto the path of self realisation. Sarvajna is He who is not only aware of the interactions of Maya and Realism but is fully equipped with the awareness and methodology of attainment. From the stage of Sarvajna who has the knowledge of ‘Gunas’, the devotee has to qualify to realise the Self (Atma) and to Siva Himself as that Super Power is Paramatma, Pranavatma, Avinashi and Mahadeva.